The specific project that Amaterra is funding is a green job training program that WMG is running in partnership with Goodwill. The funding will be used to cover the time of expert instructors working with the youth and for some project materials to complete the project. Over the next two months, WMG will teach how to create a food-producing rain garden. We will start with facilitating a design activity, where young people will learn how to design a landscape and contribute their ideas. Once the design is finalized, they will help with implementing the garden step-by-step. They will create sunken veggie beds, work on soil enhancements, and create a surrounding rain garden with native plants to attract pollinators like bees to the garden area. They will participate in planting and caring for the garden as well. They will learn about water-wise gardening and desert appropriate food crops at WMG’s Living Lab and Learning Center. 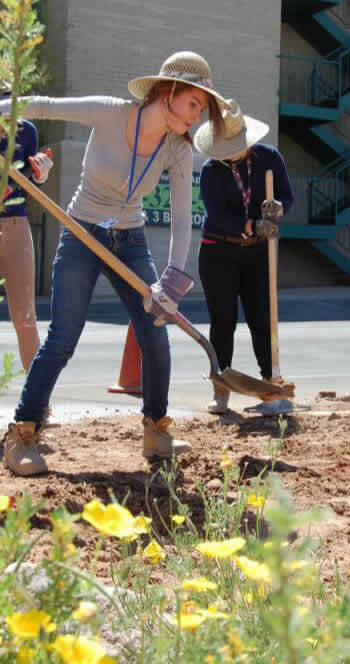 We will work with the youth weekly to implement sustainable features at the Living Lab, including rain gardens, greywater systems, native and edible gardens, rain tanks, and natural building projects at WMG’s Living Lab and Learning Center. 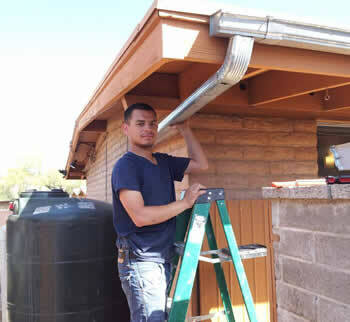 WMG also has been working in Tucson neighborhoods (three currently) as teaching composting, demonstrating ways to capture runoff from rains and guide the water to tree wells (a really important project in areas where the streets regularly flood during storms), and encouraging the implementing of water storage tanks. In addition to the strong local presence, WMG also has similar projects in foreign countries. Last year they partnered with Grampari, an organization in India, to give technical support and train new workers in the areas of sanitation and watershed management. This year they are shifting their emphasis to the Southwestern United States and Mexico. Click here to view their excellent website complete with Youtube videos.